How long has your business operated? Jim: Metcalfe’s Market is a chain of locally owned, fourth-generation (working on a fifth- generation) grocery stores out of the Madison area (two stores) and Wauwatosa (one store). We started in 1917, so we’re coming up on our 100th anniversary. We’re an upscale, quality service operation. Why did you decide to feature Wisconsin fish? Jim: We’re starting to expand a little bit more. We carry over 3,000 local foods. That’s probably the biggest hook (no pun intended) we have with our customers. There’s nobody in the state that does local better. We started our campaign 10-12 years ago before it was a catchy thing. Working with a couple of local people, in the next few weeks we’re going to start carrying some Atlantic salmon that’s being farmed in former trout ponds in the Gays Mills area. We’re also working with a company called Clean Fresh Food out of Belleville where they have an aquaponics system where they grow tilapia and lettuce. We have some trout out of Westfield and there’s Falcon Aquaponics out of Slinger, Wis. Kathy Kline’s been helping us find tilapia facilities so we can use fish from these people. 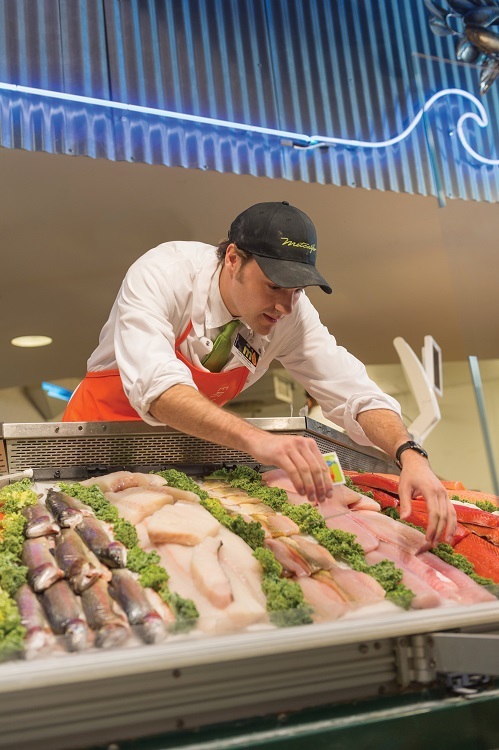 We like to use Wisconsin fish to help keep business local. We are a Wisconsin business and anything we can do to keep the business in-state and help local businesses, that’s what we’re trying to do. 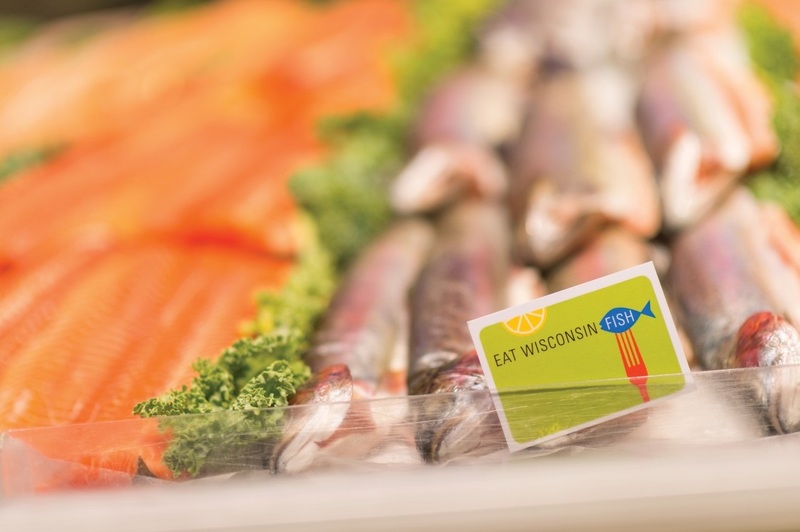 Why should people buy Wisconsin fish? Jim: To support the local economy. If we can support a local farmer or fish hatchery, that’s what we want to do. The carbon footprint is a big deal to us, too. Tilapia is a perfect example. If we can get it from Belleville or Slinger, which are ten to thirty miles away, compared to Honduras or Ecuador, it’s much better for the environment, and the fish is fresher. We’ve partnered with FishWise from out in the San Diego area, too, to work on our sustain- ability program. We follow their rules and regulations. That’s who we turn to to see if and what we can carry. For instance, when we first started, we had to eliminate orange roughy. We sold a lot of it, but because it’s not really a sustainable product, we don’t sell it anymore. The environment and what’s right for the future are all tied into the local aspect of what we do. What is one interesting thing you’ve learned about the fish itself? Jim: How aquaculture works is really fascinating. We visited some of the facilities and it was fascinating to learn how a species like tilapia can be grown in Wisconsin. Same about the Atlantic salmon that we’re going to carry. They source the eggs from Maine. It took them three years to get these eggs. But to know that these species that are from the ocean can actually be grown in Wisconsin is pretty cool. 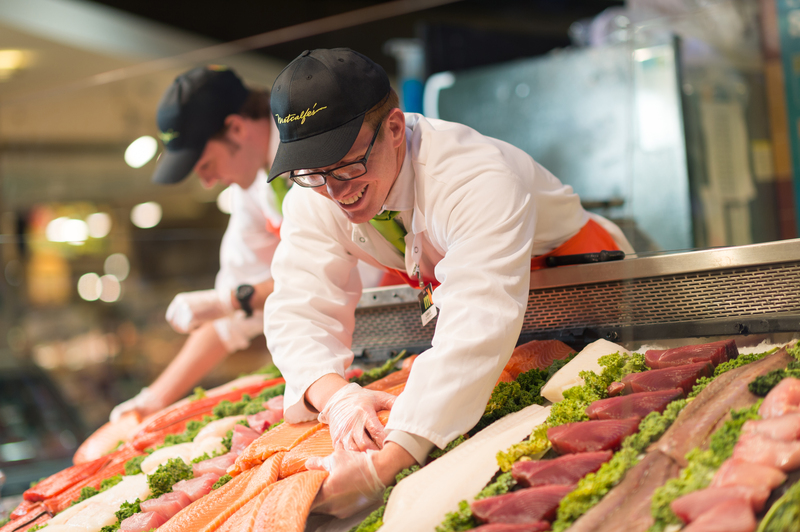 What is one thing you would like consumers to know about how your fish are harvested or raised? Brad: The one unique part about being partnered with FishWise is that it has a system in place where their main goal is transparency. That goes along the lines of, even though we may carry some fish that aren’t sustainable, it’s right there for the consumer to see. All the different species are labelled by what type of farming method was used, if it was wild caught, country of origin, if it’s sustainable or not. All of our signs explain how the fish are harvested or raised. All the employees here go through a training video that’s provided by FishWise to make sure they can answer any questions customers might have. What is your favorite recipe for your fish? Jim: I’m a big fan of bluegills and lake perch. Just rinse off, dip in flour, followed by milk then a combination of bread crumbs and saltines, and slowly pan fry on the stove. It’s top-notch! Brad: For salmon, I use equal parts butter and Worcestershire sauce, two lemons squeezed, and cover that with sauteed mushroom and onions. Bake it in a two-inch deep baking dish at 350 degrees for about a half-hour. It tastes like steak. It’s awesome. Very rich. When someone asks you if your fish (fishery) is sustainable, how do you reply? Brad: That’s covered through the FishWise program we’re in. I give customers as much information as possible. We try to be as sustainable as possible, but with business realities, there are some fish that aren’t as sustainable as others. There is kind of a fluid situation with species sustainability. The FishWise program updates the rankings. How many Wisconsin residents does your organization employ? Between the three stores and our corporate offices, Metcalfe’s employs about 500 people all together. If we can support a local farmer or fish hatchery, that’s what we want to do.